We are committed to formulating and manufacturing nutritional supplements that are 100% clean. 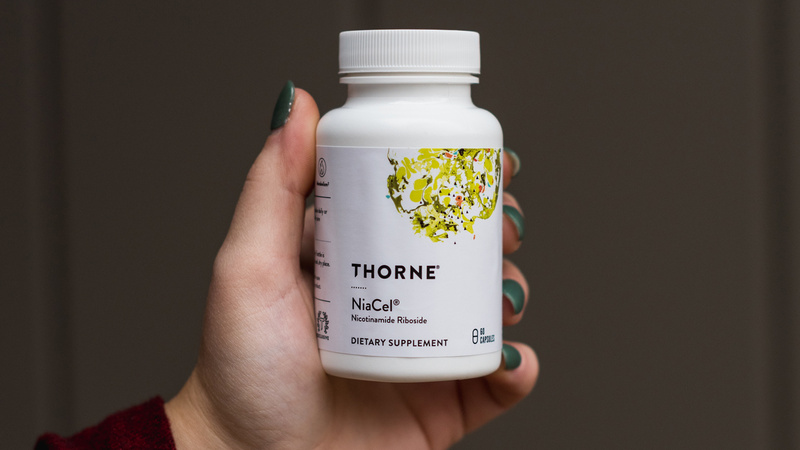 At Thorne, clean describes supplements that do not contain any harmful or unnecessary ingredients. Our "No" List guides us every day in choosing which ingredients to source and how to formulate new products, so you can feel confident about what you are putting in your body. An artificial sweetener. It has been linked to insulin resistance and high blood sugar. Includes more than 200 substances (including anabolic agents, narcotics, and growth hormone secretagogues) that will disqualify an athlete from competition. Artificial preservatives. When mixed with vitamin C it can yield benzene, which is carcinogenic. An artificial antioxidant preservative. Carcinogenic, it accumulates in the lungs, liver, and kidneys and is associated with stomach tumors in animal studies. An artificial antioxidant preservative. It accumulates in the liver, and is associated with liver tumors in animal studies. A plasticizer used in water bottles and other plastic containers. It mimics estrogen in the body and can disrupt thyroid hormones, causing infertility, miscarriage, erectile dysfunction. Also can adversely influence fetal development and increase cancer risk. A natural red/crimson dye. Made from female cochineal insects, it can cause allergic reactions and anaphylaxis. Among the eight most common allergens. They can cause allergic reactions and intolerances. A botanical used in Traditional Chinese Medicine. It contains ephedrine, which was used and abused in weight loss products and banned in the U.S. Ephedra abuse can cause increased blood pressure, heart rate, and possibly heart attack and stroke. Artificial vanilla flavor more potent than vanillin, used to give chocolate a vanilla flavor. It is manufactured from petrochemicals and has been reported to cause allergic reactions and headaches in sensitive individuals. Used to sterilize food, botanicals, and spices. The World Health Organization (WHO) classifies ETO as a Class 1 carcinogen. It is highly toxic to kidneys, liver, and nerves and is banned in the U.S. Artificial colors and dyes. They often contain aluminum, sometimes contain lead and mercury, and have been linked to cancer, hyperactivity, and allergies. Used as solvents, sweeteners, and preservatives. They are allergenic and are a toxic to the kidneys, liver, and nervous system, and even more toxic to infants, who metabolize them slowly. A sweetener made from corn starch. It is a major contributor to fatty liver, metabolic syndrome, obesity, diabetes, and inflammation, and can be contaminated with mercury. Oil fillers in softgels. Examples include partially hydrogenated soybean oil. Because trans-fats are associated with heart disease, stroke, diabetes and inflammation, the FDA removed them from its Generally Recognized As Safe list in 2015. Used to sterilize foods and botanicals. It is controversial because of the lack of long-term safety studies, and it has been banned for use in dietary supplements in the United States. Among the eight most common allergens. They can cause allergic reactions and anaphylaxis. Coating on tablets. Used to make tablets smooth and easier to swallow, it is often contaminated with carcinogens, including 1, 4, dioxane, ethylene oxide, and polycyclic aromatic compounds. A synthetic antioxidant preservative. It is a carcinogen, and can also induce asthma, stomach irritation, and possible endocrine disruption. An artificial sweetener. It can cause bladder cancer in animals, and there are no strong studies proving safety in humans (only observational). As a sulfonamide it can also cause allergic reactions. An artificial preservative. When mixed with vitamin C it can yield benzene, which is carcinogenic. Sugar alcohol used as a sweetener. It can cause diarrhea, gas, and bloating. Manufacturing aids. They lubricate, help ingredients flow, and allow more material to be packed in a capsule. As long-chain fatty acids, they can inhibit the absorption of nutrients. An artificial sweetener. It has caused leukemia in animal studies and in humans is associated with bowel inflammation and a decrease in beneficial GI flora. Preservatives. Although they can occur naturally in foods, they are often added in manufacturing. They are allergenic and can cause severe asthmatic reactions in sulfite-sensitive individuals. Artificial vanilla flavor. Natural vanillin is a constituent of vanilla. However, synthetic vanillin is used in imitation vanilla flavoring and is generally manufactured from petrochemicals. Another is from genetically modified yeast. It may trigger allergic reactions, GI upset, or migraines. A synthetic antioxidant related to BHA and BHT. It is tumorigenic and neurotoxic, and can cause liver enlargement. A metallic colorant that makes ingredients white. It has been classofied by the International Agency for Research on Cancer as a Class 2B carcinogen (i.e., "possibly carcinogenic to humans"). What's Really on the Thorne No List?